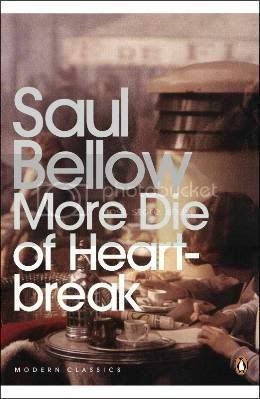 Saul Bellow is the biggie. Every writer I admire sings out in tongues of praise for him, but I have always struggled with getting much in the way of either instruction or delight from his books. And God knows I have tried. So the reissue of all his novels over the next few months seems like a good time to make a fresh start. Plus now he’s dead somehow I don’t feel so intimidated. I’m a huge fan of Penguin Modern Classics, but they’ve used Bellow to relaunch the series, and I’m not sure about the covers: there’s something seventies about that typeface, the white stripes and spine, and the faded photography. Not a brilliant first impression. 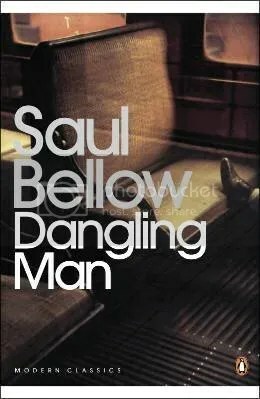 Dangling Man is Bellow’s debut from 1944, bringing us into his twin worlds of thought and fascination, and of colourful characters. The book takes the form of a journal kept by Joseph, surname undeclared, as he waits for his call-up by the Army after enlisting, when “there is nothing to do but wait, or dangle, and grow more and more dispirited.” To keep his spirits up he records his thoughts, contrary to the spirit of the day (“Do you have feelings? There are correct and incorrect ways of indicating them. Do you have an inner life? It is nobody’s business but your own. Do you have emotions? Strangle them”). At the root of it all was my unwillingness to miss anything. A compact with one woman puts beyond reach what others might give us to enjoy; the soft blondes and the dark, aphrodisiacal women of our imaginations are set aside. Shall we leave life not knowing them? Must we? We had an enormous sunset, a smashing of gaudy colours, apocalyptic reds and purples such as must have appeared on the punished bodies of great saints, blues heavy and rich. I woke Iva, and we watched it, hand in hand. – while at the same time to know that “the real world is the world of art and thought. There is only one worthwhile sort of work, that of the imagination.” He laments the times when he could go to a bar and have discussions on “socialism, psychopathology, or the fate of European man.” But that doesn’t stop him from sharing his philosophical thoughts with us, and this is where my main problem with Bellow lies. My shoes, their once neat points scuffed and turned up, squashed, as I walked, through half a dozen leaks. I moved toward the corner, inhaling the odors of wet clothes and of wet coal, wet paper, wet earth, drifting with the puffs of fog. Low, far out, a horn uttered a dull cry, subsided; again. The street lamp bent over the curb like a woman who cannot turn homeward until she has found the ring or the coin she dropped in the ice and gutter silt. … The awning heaved; twists of water ran through its rents. Once more the horn bawled over the water, warning the lake tugs from the headlands. It was not hard to imagine that there was no city here at all, and not even a lake but, instead, a swamp and that despairing bawl crossing it; wasting trees instead of dwellings, and runners of vine instead of telephone wires. While Dangling Man is considered by those in the know to be minor Bellow, a mere working of his muscles before he got to the good stuff, I found it to be everything I had liked and hated about his later books in embryo. I will need to keep trying then for what Martin Amis, his great admirer, calls “a transfusion from above,” and settle in the meantime for a transfusion from Bellow. The work goes on. Another of those authors, whose names crops up time and again, but who I havent quite got to reading yet. Not sure if this one sounds a good place to start though. I’m not usually put off by lengthy philosophical asides, but the example you gave made no sense to me either. I have read Bellow and he, along with Roth, are two authors I know I am supposed to like and be impressed with but they leave me cold. I do not intend to keep trying. I admire your confidence, Candy! I think I am still too easily swayed by What I Am Supposed To Like. Having said that, Roth was once a closed book to me but I am currently very much enjoying his new novel Exit Ghost. So who knows? That’s the new Penguin cover design?? It’s just ugly! Fraid so, Rob. Some of the others in the series, like Bellow’s More Die of Heartbreak, are nicer. But I really think Penguin, always reliable for a good cover design, might have really fouled up this time. Shame. I was just thinking yesterday that even their new Popular Classics design is really good. (I like that simple green design a lot, and I don’t think it diminishes from the individual character of each book.) But this looks like an advert for an airline in a ’70s (as you say) magazine. I’m looking for the martini glass and air stewardess in excessive makeup. I read this recently and was over the moon to finally get off the mark on Bellow and may even feel my way towards The Adventures Of Augie March by way of The Victim in the near future, such is the feeling of accomplishment. Sad as that is. I admit that some of Bellow’s philosophy was a drudge to get through – argument heaped upon digression upon argument – but found the one you cite, about greatness, quite a straightforward one. My initial feeling to the book, when I finished it last week, was perhaps the same as yours in that I wasn’t all that impressed. But, it’s a book that’s been dangling in my mind since and it’s gone up in my estimation. I’m sure reading it again will push it further up. Great payoff line, by the way. Thanks – I can still crank out the atrocious puns when I need to! I’m still trying to work out what Bellow to tackle next. Humboldt’s Gift keeps drawing me, for some reason, though it is much longer than the other main contender, Mr Sammler’s Planet (which also – and why wouldn’t I? – has a nicer cover). Stewart, I’d suggest going to The Adventures of Augie March before The Victim. It’s been a while since I read either, but I do remember that I found a lot to like in Augie March, while The Victim left me cold. Humboldt’s Gift is the best of his I’ve read. The Victim and Herzog next along. Augie March still seems too convoluted to me, as brilliant as it clearly is. I think Humboldt’s Gift is the best distillation of his antic meticulousness and bizarre, all-catching ear. The dialogue exchanges outstrip any other writer I’ve come across in their sheer authentic wit. I’m trying to think of another writer that gets close. Roth obviously. Easton Ellis. Nabokov. Jacobson. Amis. Updike. All wonderful but they’re not Bellow.